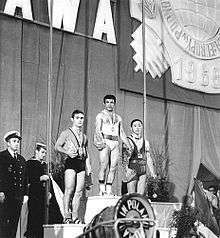 Atanas Kirov (Bulgarian: Атанас Киров, born 24 September 1946) is a retired Bulgarian bantamweight weightlifter. Between 1973 and 1975 he won the world titles and three European titles and set two world records in the total. He competed in the 1968 and 1972 Summer Olympics and placed seventh and fifth, respectively.